Click here for MOBI-ARC support documentation. (Not currently in production) The MOBI-ARC Control Unit is an on-board computer engineered to teach your alternator how to weld. It can connect to, and control, most automotive and truck alternators. When MOBI-ARC is fitted to any vehicle, the alternator is regulated by the pulse-width modulation (PWM) regulator built into the MOBI-ARC’s circuitry. During daily driving, the alternator is regulated at an automotive-friendly 14.3 volts (or 28.6 volts on 24v vehicles). 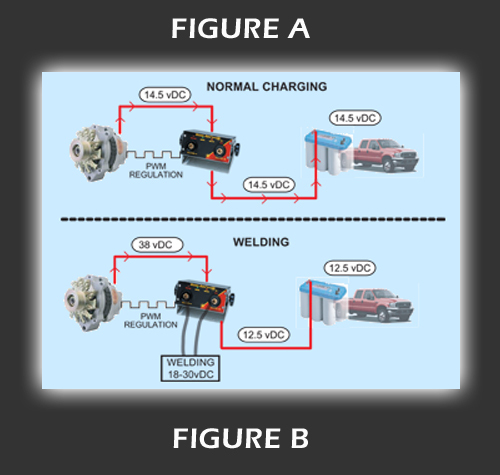 The current flows through the control unit and passes to the vehicle’s battery (FIG A). When welding is desired, the welding cables are inserted. Until an arc is struck, the alternator continues to charge the battery as normal. 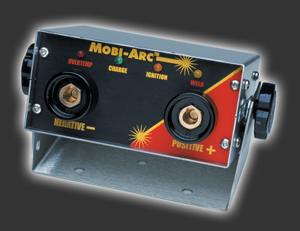 When the arc is struck, MOBI-ARC instantly breaks the connection between the alternator and the battery. This isolates and protects the vehicle’s battery and electrical system. The alternator is then ramped-up to 38 volts open circuit which is optimum open circuit voltage for the welding process. (FIG B). Weld as long as necessary. If welding ceases for more than fifty seconds, the MOBI-ARC will automatically ramp the voltage back down to an automotive friendly 14.3 volts and restore the connection to the battery.